The recommendations have been grouped into six major reform areas. These reform areas bring together recommendations that require a similar or coordinated response, such as developing mandatory Codes of Practice, or managing social and cultural impacts. All reform areas will be implemented with the objective of building trust through transparency. 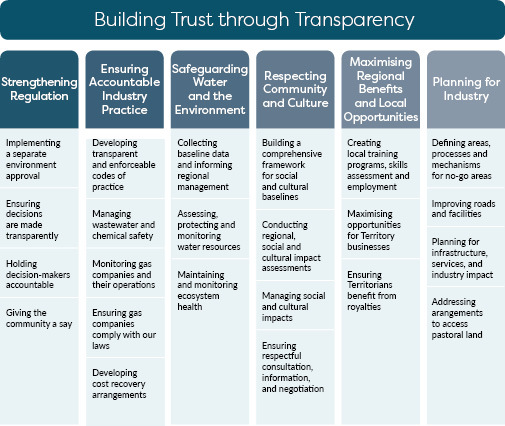 The reform areas are: Strengthening Regulation; Ensuring Accountable Industry Practice; Safeguarding Water and the Environment; Respecting Community and Culture; Maximising Regional Benefits and Local Opportunities; Planning for Industry. Some recommendations correlate with actions across the six reform areas. For consistency and accountability each recommendation is captured by only one action group within the six major reform areas. Further information on the recommendations is outlined in the following tables.